Mayor Teresa Jacobs welcomed citizens and Orange County employees to the Second Annual Spring Festival and Battle of the Bands at Barnett Park on April 18. Each Battle of the Bands ensemble featured at least one county employee in the group. Participants included the Backyard Band, Low Bid Band, The Down Brothers Band, The Unreasonable Men, and Ritmo Y Sabor. 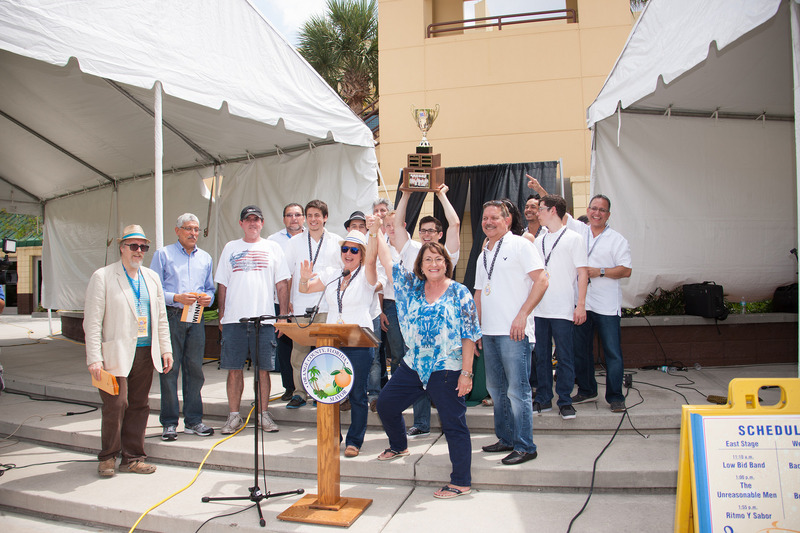 After hours of entertainment, the judges made their decision and Mayor Jacobs and County Administrator Ajit Lalchandani presented the winning band, Ritmo Y Sabor, with the Mayor’s Cup. Diana Almodovar, manager of Orange County’s Development Engineering Division for the Public Works Department, said Ritmo Y Sabor has played together for about a year. The band includes her husband, John, sons Allen and Alex, nephews José and Emmanuel , and brother-in-law José, and other friends. Battle of the Bands judges included Ben Gardner, CEO and founder of OrlandoBands.com; Tod Caviness, Orlando Sentinel nightlife columnist; and Thomas Bolen, former FAMU Marching 100 drummer and lifetime musician. Attendees enjoyed the free, five-hour event that featured live entertainment and special activities including a fun zone for children, table-top games, bounce houses, a rock climbing wall and face painting. Food trucks offered a variety of culinary delights, including Basil’s Barbecue, Bem-Bom Portuguese cuisine, Twin Tigers Ice Cream, and Kona-Ice. The Mayor’s Cup with the winning group’s name engraved on it is now on display in the Orange County Government Administration Center. Named after Pine Hills developer Gordon Barnett, the 159-acre Barnett Park offers a variety of amenities: walking path, playground, splash pad, skate spot, disc golf, tennis courts, basketball court, golf driving nets and putting greens, sand volleyball, cricket pitch, ball fields, boat ramp, and lake fishing, as well as indoor recreation facilities and a fitness center. A collection of photos from the Second Annual Spring Festival and Battle of the Bands is available for use by the media and are located on Flickr.